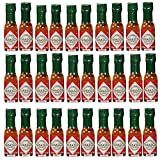 Tabasco sauce is a popular brand of hot sauce made by the McIlhenny Company. It is made from tabasco peppers, vinegar, salt, and other condiments, and is aged for three years in white oak barrels. In 1868, Edmund McIlhenny mixed up his own personal pepper sauce recipe with three natural ingredients: fully aged red peppers, salt from Avery Island, Louisiana, and high-quality, distilled vinegar. Decades of competing recipes have only confirmed that the flavor of McIlhenny's recipe could not be surpassed, and today TABASCO Original Red Sauce is still made in essentially the same way. 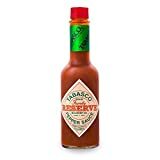 Our TABASCO Family Reserve hot pepper sauce was once reserved for the McIlhenny family and close friends, but is now available to a select market.